Traditional Chinese Medicine has used Royal Jelly for thousands of years to restore your vitality, stimulate your libido, and promotes a long life. Grand Health’s Royal Jelly uses high potency ingredient from Queensland, that contains 2% of 10-HDA (hydroxyl decanoic acid , or royal jelly acid). 10-HDA is the key measurement in the antibacterial effect of royal jelly. Natural royal jelly contains about 1.5% of 10-HDA. Royal Jelly is used exclusively in a hive to feed the Queen and newly hatched larvae. It is produced by hypopharyngeal and mandibular glands of worker bees. Royal Jelly offers an abundance of B Vitamins including thiamine, riboflavin, pyridoxine, niacin, pantothenic acid, biotin, inositol, and folic acid. 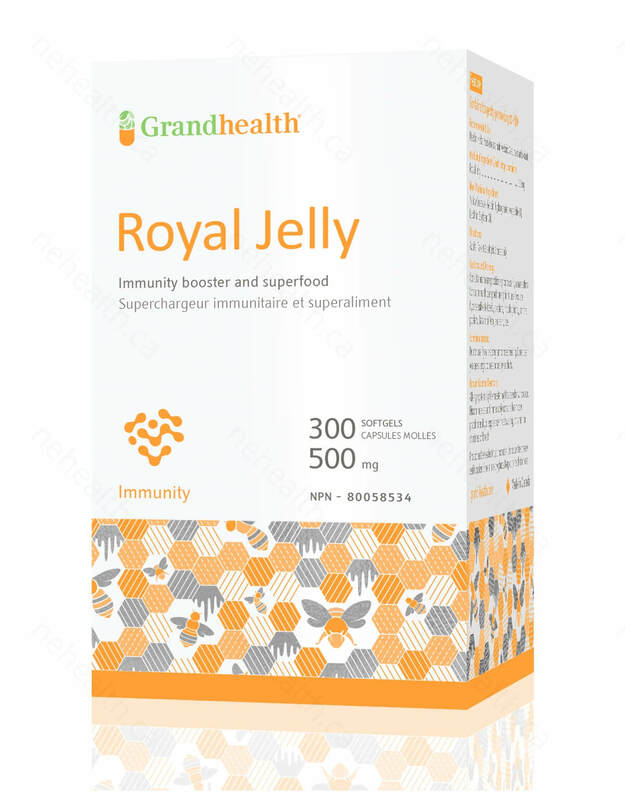 Royal Jelly also contains Vitamins A, C, and E. Royal Jelly is made up of twenty amino acids, and is a highly concentrated source of rich proteins. 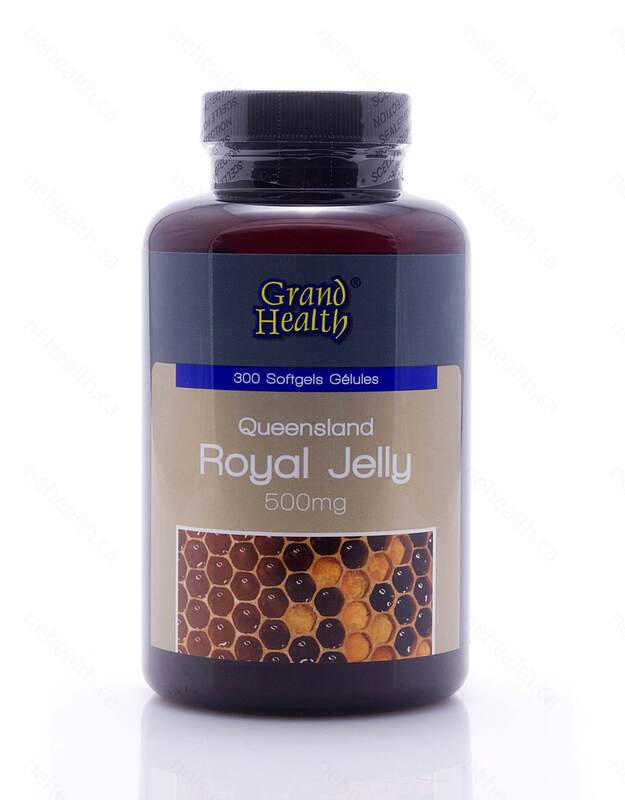 Royal Jelly provides important fatty acids, sugars, sterols, phosphorus compounds, and acetylcholine. In addition, Royal Jelly is rich in nucleic acids DNA and RNA, the building blocks of life. 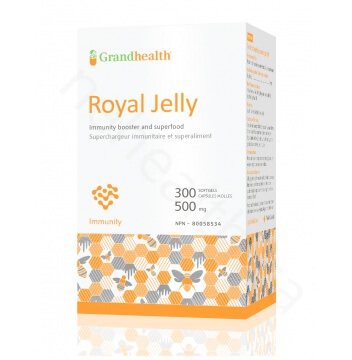 Royal Jelly also contains gamma globulin, which works internally to fight against bacteria, viruses, and toxins. Soybean Oil, Hydrogenated Vegetable Oil, Unbleached Lecithin, Gelatin, Yellow Beeswax. Adults: Take 1-2 softgels 3 times per day. Consult a healthcare practitioner prior to use if you are hypersensitive to bee by-products. Fujiwara, Suguru, et al. "A potent antibacterial protein in royal jelly. Purification and determination of the primary structure of royalisin." Journal of Biological Chemistry 265.19 (1990): 11333-11337. Nagai, Takeshi, et al. 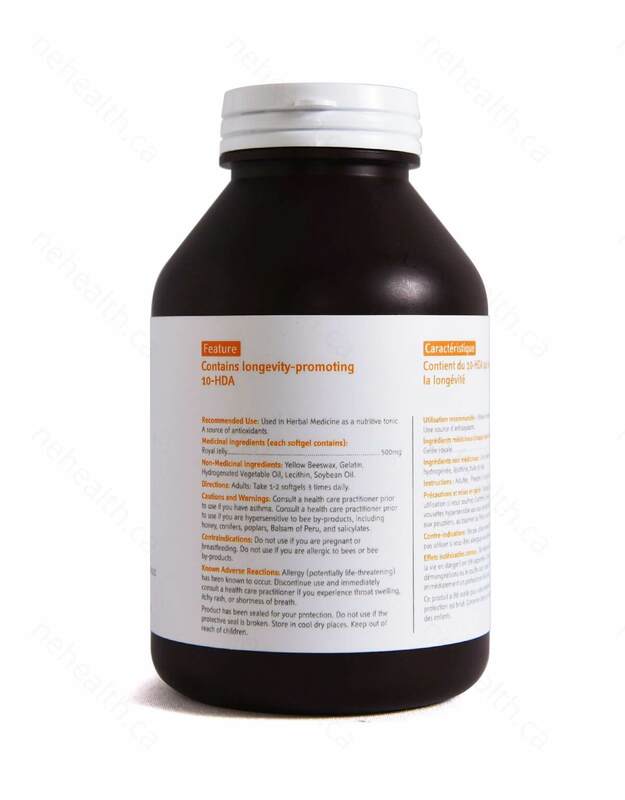 "Antioxidative activities of some commercially honeys, royal jelly, and propolis." Food chemistry 75.2 (2001): 237-240. Blum, Murray S., Arthur F. Novak, and Stephen Taber. "10-Hydroxy-Δ2-decenoic acid, an antibiotic found in royal jelly." Science 130.3373 (1959): 452-453. Fujii, Akira, et al. "Augmentation of wound healing by royal jelly (RJ) in streptozotocin-diabetic rats." Japanese journal of pharmacology 53.3 (1990): 331.